Continued from day 6. Continued on day 8. 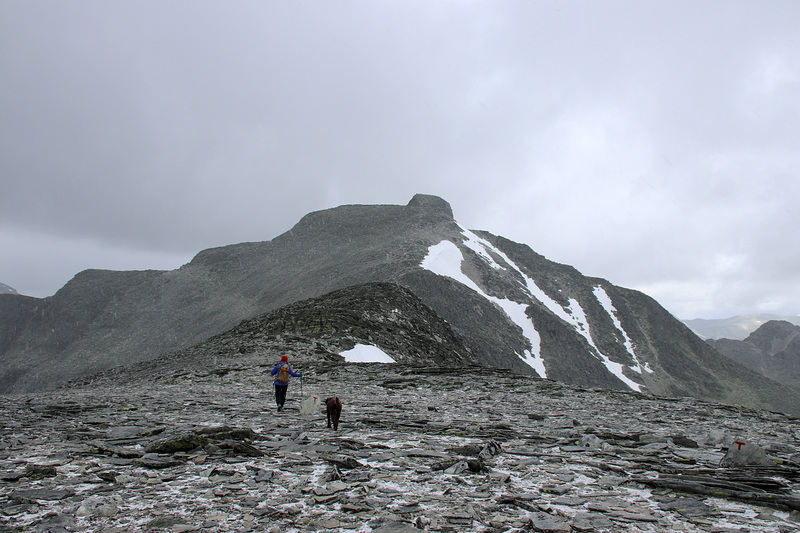 Thursday, and the weather seemed to permit what we had hope we could accomplish – when we chose Mysusæter and Rondane Høyfjellshotell as base-camp for a few days: an hike up Veslesmeden. We could rent bikes at the hotel, for free. It was definitely a bonus point, but the cabin rental price still felt quite painful. 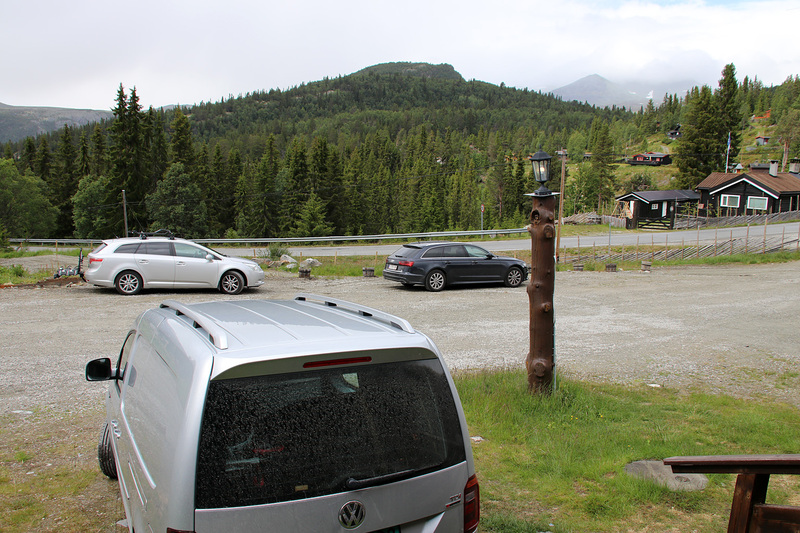 We drove up to Spranget, where the public (toll) road ends, and got ready for a 5km bike trip along the gravel road. The dogs led on like they were on for a very important mission. No going side to side, smelling the roses. Just straight on. Very funny to see. 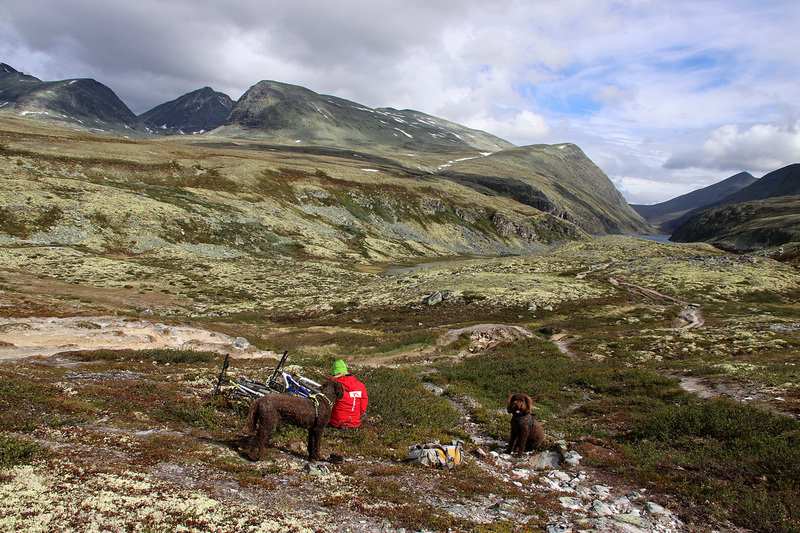 We never meant to bike all the way to Rondvassbu, but we parked the bikes a bit too early. We should have kept on going until we saw the path from Rondvassbu. 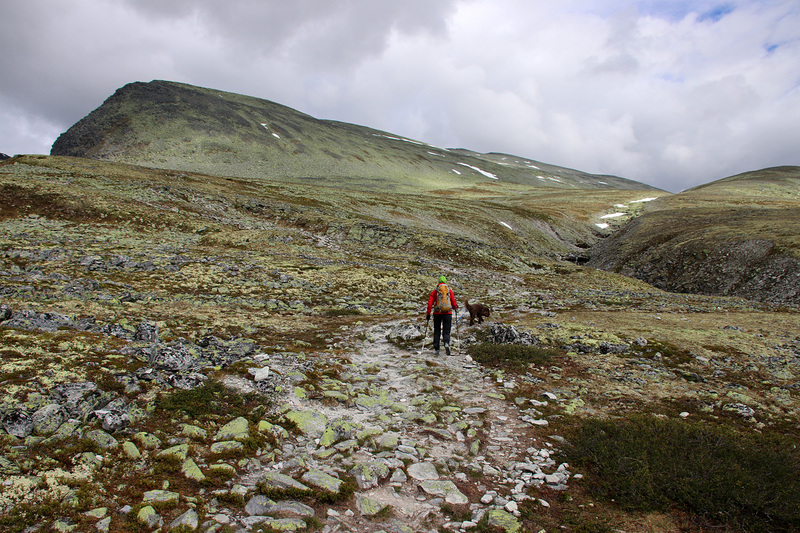 This led to a slightly cumbersome start, including some steep off-trail and crossing of Jutulhogget. 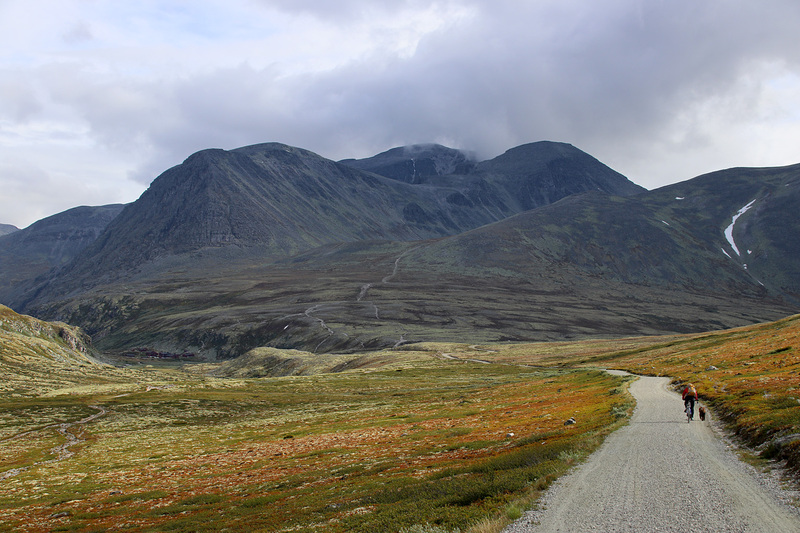 Eventually, we were on the path to Rondhalsen and worried gradually more and more about the weather. 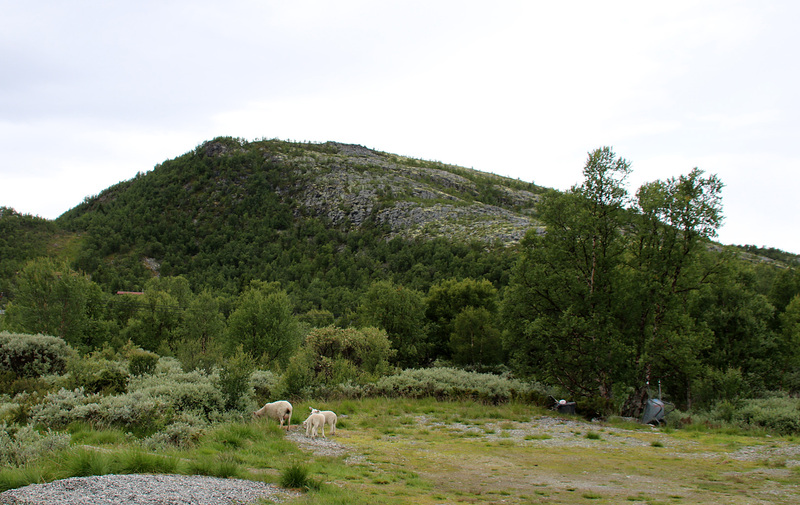 We reached the trail fork at Rondhalsen and climbed northwest towards the ridge. It had started to snow light and we discussed what to do. I was under the clear impression that this was a snow shower, and that it would pass. Then we should just hit the top as fast as we could and get back down before the next shower came along. 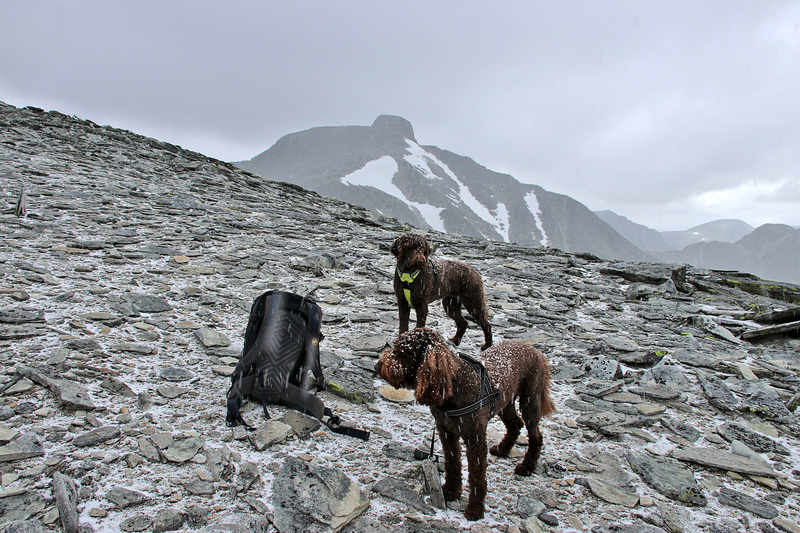 Snow in itself isn’t a problem for neither us nor the dogs, but when combined with wind, the dogs are unprotected. We agreed to move on. We passed point 1871m, descended a little before taking on the final hill towards the top. The snow shower passed and we had good conditions upwards. We reached the top 12:29pm – 3,5 hours after leaving Spranget. This was our 2nd 2000m top this year. Which is not a feat in itself, but with Anne’s mysterious problems with the energy level, every high top is worth celebrating. It started to snow again, so we decided to get off the mountain. 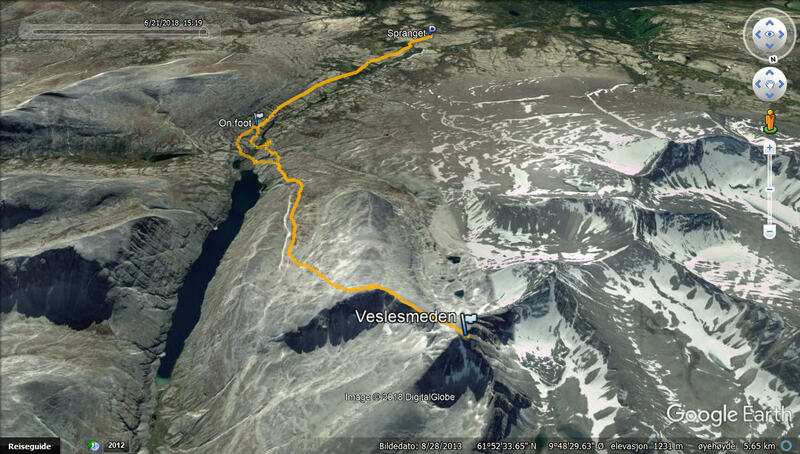 This time, we followed the path down to Rondvassbu, and it snowed until we reached 1300m elevation (!) Then we followed the Spranget road back to the bikes. We returned to Spranget 6h:20m after leaving. It is snowing! June 21st! Back at the bikes. Weather not good up there now. 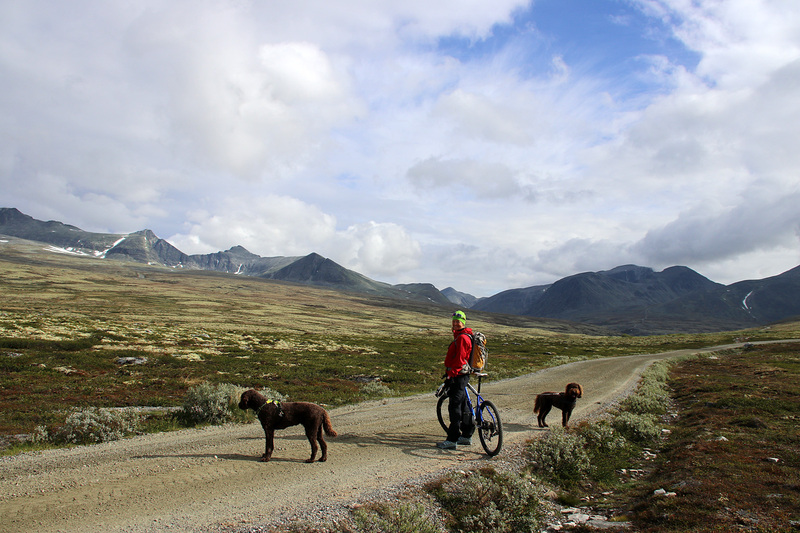 We returned to Rondane Høyfjellshotell. Anne looked forward to sit down with a book, and as it was still early in the day, I decided to pay Kåsen a visit. 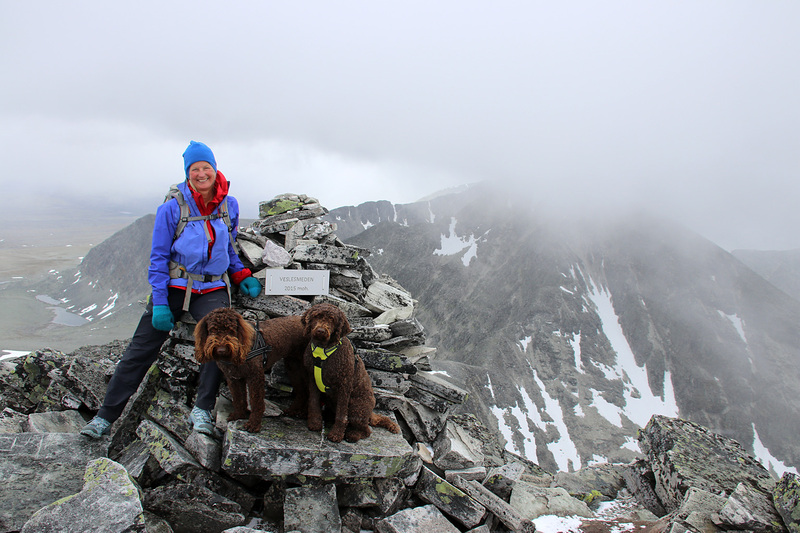 The dogs had earned a quiet afternoon and I left them with Anne. So, I took the hotel bike and without knowing anything about any path or where it would make sense to start, I biked along the river towards Lurven. After 2,8km, I noticed a bridge across the river and followed the road to a parking lot. A path continued from here, which would take me even closer to the mountain. Eventually it was time to leave the bike behind and proceed on foot. I went up to the nearest cabin, aiming for the northeast ridge. Then I found a perfectly marked and well worn path. I really liked the north side of this mountain. It felt like going from terrace to terrace. The path took me up to the trig. point, but the high point (1m higher) was 80 meters to the northwest. 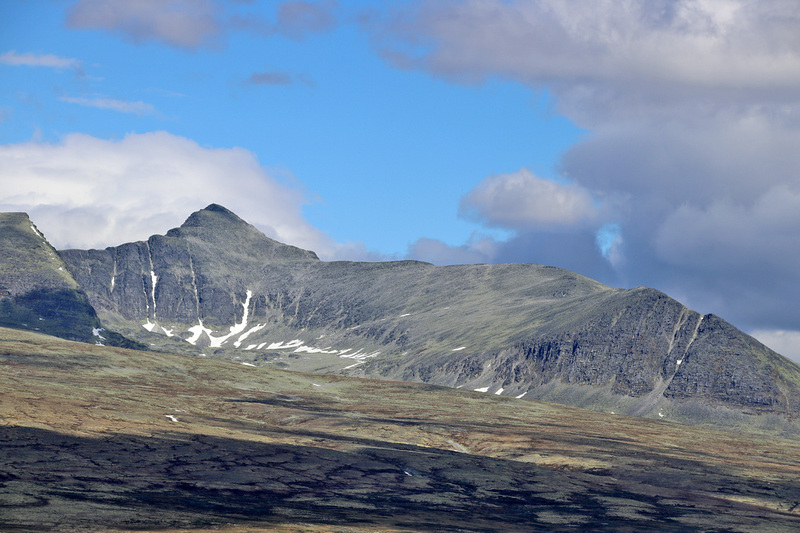 I was looking down on Rondane Høyfjellshotell and called Anne – asking her to come out. I could see her quite well through the lens, but she couldn’t see me.